Flatness reinterpreted | Pasta & Co. This is one other recipe I got from GialloZafferano.it, one of the trendiest food blog in Italy. I loved this recipe since the very beginning because it actually reinterprets the flatness of the sole. Sole is very “flat” in flavor, but lemon and herbs give that kick. This recipe is a wonderful alternative to the tasty Sogliola alla Mugnaia (basically a floured sole fried in butter after soaking in milk). These sole rolls can well serve as an appetizer, a finger food option at parties or as an entrée. Mince garlic, chives, parsley, rosemary, thyme and sage and chop three olives. Pour into a mixing bowl and set aside. Grate a lemon and set the lemon zest aside in a mixing bowl or a plate. Cut in two and get the juice out of it. Slice the other lemon and set the slices aside for decor. Wash the fillets under running water and tap try with paper towel. 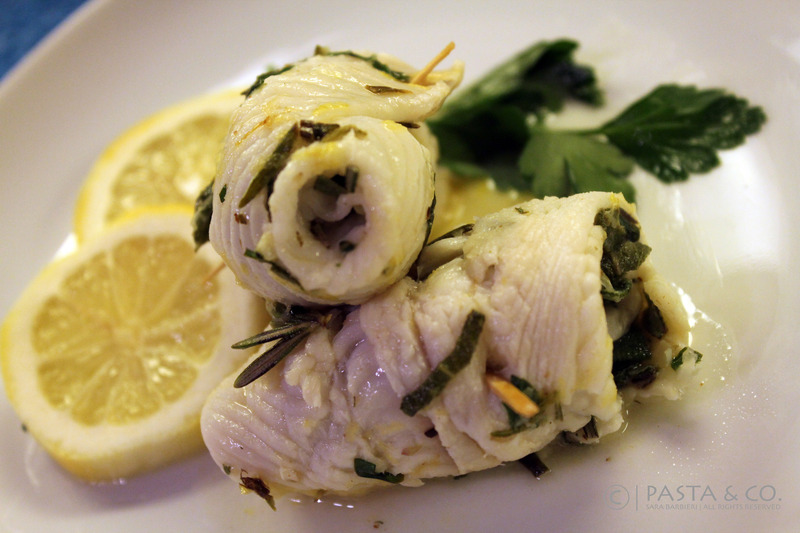 Spread each side of the fillet with a thin layer herbs and sprinkle with lemon zest. Roll up the fillets tightly, starting with the widest side. Use a toothpick to hold the fish together. Take a pan, add butter and add the rest of minced herbs and chopped olives. After a few seconds, add the sole rolls. When they get that light golden color, sprinkle lemon juice and zest, and add white wine. Turn the rolls on the other side so that the cooking process may be uniform. Cook for 3-4 minutes more, garnish with lemon slices and serve immediately!